UNDER CONSTRUCTION. Rare Opportunity...Quick Move-In Villa with No Maintenance! 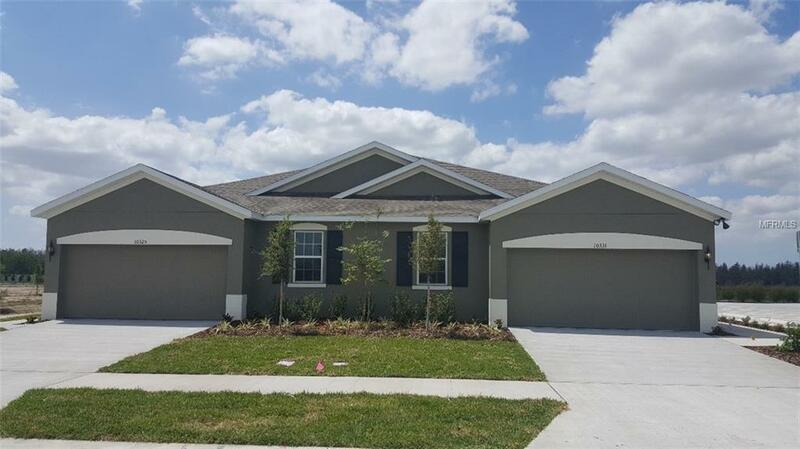 Granite Countertops in Kitchen, Stainless Steel Appliances, Espresso Cabinets, Upgraded Ceramic Tile, Decorative Glass Insert in Front Door, Tray Ceiling in Foyer and Owner's Suite, Kitchen Island with Pendant Lights, 9'4" Ceilings and more. Low maintenance villas in Ryan Homes newest master-planned community Cypress Preserve. These paired villas offer 3 bedrooms, 2 baths with a 2 car garage. The Magnolia plan is a one story great room layout with 18 x 18 ceramic tile in all the wet areas, maple cabinets throughout, covered lanai and ebony microwave, range and dishwasher. Cypress Preserve is conveniently located to The Shops at Wiregrass, Tampa Premium Outlets, Costco, Lowes, Publix, major roadways and highways and restaurants for all the discerning tastes. The community amenities include a zero entry pool with cabana, dog park, playground and an event lawn for activities.Disclaimer: Prices, financing, promotion, and offers subject to change without notice. Must use NVR Mortgage to receive promotion. Offer valid on new sales only. Cannot be combined with any other offer. See a Sales & Marketing Representative for details. All uploaded photos are stock photos of this floor plan. Home will look similar to photos.